Built by Boeing at Seattle. Delivered to the U. S. Army on December 1, 1941 and piloted by Harry Spieth from Boeing Field. Assigned to the 19th Bombardment Group, 28th Bombardment Squadron. No known nose art or nickname. During January 1942, this bomber operated from Hickam Field and flew patrol missions over the ocean. On January 16, 1942 the bomber claimed to locate, bomb and sink a Japanese submarine. Next, this B-17 was ferried from Hawaii to Australia. 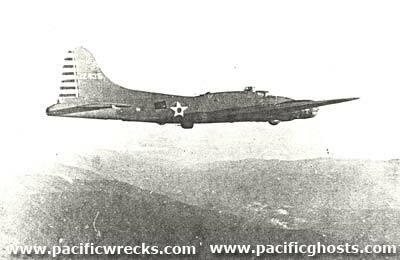 Possibly this B-17 was flown on the first American bombing mission against Rabaul on February 22/23, 1942. On March 12, 1942 this B-17 took off from Horn Island Airfield piloted by Horgan and Fields on a mission against Salamaua. Afterwards landed at 7-Mile Drome and overnighted there. On March 13, 1942 took off 7-Mile Drome near Port Moresby on a mission against Rabaul piloted by Major William Lewis, Jr. and co-pilot 1st Lt Jack L Carlson with a crew consisted of five men from the 435th Bomb Squadron and six from another unknown unit. The other three aircraft returned direct to Townsville due to engine trouble. Over the target, this B-17 successfully attacked Lakunai Airfield claiming several aircraft on the ground destroyed. Returning, this B-17 encountered A6M2 Zeros returning from a strafing attack on 7-Mile Drome. Top turret gunner M/Sgt Carl G. Johansson claimed an A6M2 Zero [none were lost] fifteen miles north of Port Moresby, then landed safely landed at 7-Mile Drome. On April 18, 1942, made an emergency landing adjacent to RAAF Sandgate Airfield at 5:45pm . The B-17 landed on reclaimed land to the north north between the base and the start of the Hornibrook Highway. On July 27, 1942 one of nine B-17s that participated in a bombing mission against Buna. On August 2, 1942 took off from 7 Mile Drome near Port Moresby piloted by Watson as part of a flight of B-17s searching for a convoy near Buna. On this mission, this B-17 was assigned to the 30th Bomb Squadron, but flown by an air crew from the 28th Bombardment Squadron for this mission. At 9:15am, intercepted by A6M2 Zeros and shot down. This B-17 crashed into the sea off Cape Ward Hunt on the other side of Mitre Rock, roughly two to three miles out to sea at approximately at 9:30am. At least five of the crew managed to bail out including Ranta and Abadie. Ranta was the first one to bail out, and on landing in the sea observed five other parachutes. He attempted to aid Abadie but lost him in the rough sea. Ranta made it ashore on the north coast of New Guinea, and went up and down the beach searching for the rest of the crew, but failed to find any of them. After meeting native people who were friendly to Anglican missionary Romney Gill, he was taken to Duvira then to Gill's hideout known as "X1". Later, he was joined by the crew of B-26 "Dixie" 40-1496. Together the group walked to Garaina Airfield and were flown aboard a Royal Australian Air Force (RAAF) Hudson back to Port Moresby on September 3, 1942. With the exception of survivor Ranta, the entire crew was officially declared dead on January 7, 1946. All are memorialized on the tablets of the missing at Manila American Cemetery. Etter has a memorial marker at IOOF Cemetery in Norman, OK.
Clemens has a memorial marker at ZCBJ Cemetery in Wagner, SD. Survivor Ranta died on March 9, 1974. He is buried at Sutter Cemetery in Sutter, CA at plot G-162-1. "He is Leo Rauta [sic], of Sacramento District, town Marysville, one of nine men, the crew of a F. F. [Flying Fortress] which was shot down somewhere on the other side of Mitre Rock about 9.30am last Sunday. He thinks three died in the plane which was attacked by six Zeros (their plane was at the tail end of F.F.) and knows that the other five bailed out, he saw their ‘chutes coming down after he himself reached the water. One came down near him, Sgt Abadie, and seemed to be in difficulties and sick. Leo helped him until they got separated by the sea." Bruce Hoy adds: "[March 13, 1942] Horgan was one of those who returned, so Horgan and Lewis must have switched aircraft, or someone has made a clerical error in identifying the relevant B-17."